Usually the prelude to a war is the drumming up of national spirit by those in charge. This happened before the Iraq war, and even (by the bad guys) in the run-up to World War II. Defense Secretary Leon Panetta has recently given out a lot of information that is usually considered to be classified. Panetta has said that there is a strong likelihood that Israel will strike Iran in April, May or June. He has said that Iran will have the materials to build a nuclear bomb in one year, and the means to deliver that bomb two years after that. President Obama and Panetta, playing good cops, have cautioned the Israelis that the United States opposes an attack, believing that it would derail an increasingly successful international economic sanctions program and other non-military efforts to stop Iran from crossing the threshold. A war could benefit Obama as voters are reluctant to change Presidents during a war. Meanwhile, the Obama administration is conducting intense discussions about what effects an attack on Iran. Would Iran target U.S. ships in the region or try to close the Strait of Hormuz? Would Iran launch a conventional missile attack on Israel? Finally, what effect would the war with Iran which would case a huge spike in oil prices have on the fragile global economy. First off, there would not only be a “huge spike” in oil prices—much more importantly there would be huge reduction on the amount of oil available to industrial nations. 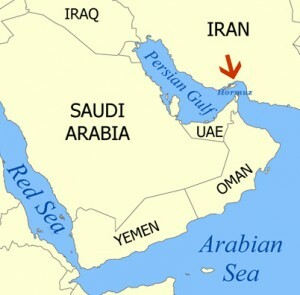 For starters, Iran could block the Strait of Hormuz, This was confirmed by Joint Chiefs of Staff chairman General Martin Dempsey said recently on Face the Nation, “They’ve invested in capabilities that could, in fact, for a period of time block the Strait of Hormuz.” That would have only a short-term effect as General Dempsey also said, the U.S. “would take action and reopen” the waterway. The greater danger comes from the fact that it would be very easy for Iran to destroy Saudi Arabia’s oil fields. This would create an oil shortage would last for years. Iran does not yet have a nuclear bomb, but they enough conventional missiles to destroy the oilfields of Saudi Arabia. Iran also has enough radioactive material with which they could contaminate the Saudi oil fields—for years to come. The Gulf countries (Bahrain, Iran, Iraq, Kuwait, Qatar, Saudi Arabia, and the United Arab Emirates) produce nearly 30% of the world’s oil, while holding 57% of the world’s crude oil reserves. Besides oil, the Persian Gulf region also has 45% of the world’s total proven gas reserves. A major portion of the oil that is shipped through the Strait of Hormuz goes eastwards to Asia (especially Japan, China, and India). A lack of oil would cause a severe world wide depression and social dislocation (today’s polite term for riots and revolution). Perhaps Hollywood director James Cameron’s decision to leave America and move his entire family to a farm in New Zealand is more than providing his kids with a “strong work ethic.” There are others of the elite 1% of Americans who are doing the same. There is an old Italian saying, “non tutti mali vengono per nuocere”—not all bad things come to hurt you. Maybe some good will come of a war with Iran. Lack of oil would be especially hard on China which lacks any reserves of its own. China would suffer the most, and most of its manufacturing capability would be gone. Factories would shut down in China and throughout Asia. This could be good as it would cause manufacturing and jobs to return to the United States. Maybe we are declaring a more important war—a war on China. I’ll have to cycle to work then…as it is, the prices of gas are way too high for me. I drive an SUV, and my wife drives another to haul our kids for everything. Killing 2 birds with one stone? Iran’s threat is real, poses a huge problem to Israel, n Iran will use their nuclear bomb to destroy Israel. We have to be prepared. If so, China’s gonna be real upset. China has to do something about this John? I subscribe to your blog, and I have learnt so much from your posts. You are fantastic with your analysis! I swear you can forecasts the political n economic futures of the world. I look fw to yr next post. What will China do, if there is this war with Iran? I’m an American,working presently in Beijing, but now, back home for a visit. Unemployed Americans can also benefit by joining the US Armed Forces if and whence US goes to wars with Iran, China, Syria or any other country. Fighting with China will require the US to have a huge army and the present fighting soldiers need to be back upped maybe manifold. Facts of life: No need to fight with China – shutting down their oil supply will defeat them. Just a small war with Iran will do the job easily – no troops needed, only bombs. if it is done as You put it, then the US will have to deal with Russia which supplies much fuel to China. controlled fighting machines to use for soldierless war as well. Now, the American People got to decide if they wish to go along with their leaders, as war will not create jobs for them anymore. Their jobs are also taken over by more machines as day goes. It must be quite tough to be an American just like it is as hard to be a Sinaporean whose jobs are taken by alien settlers. I don’t think that Russia would make a difference. Russia is having problems supplying Europe, plus the fact that Russia would not want to help its big rival, China. The US Dept. of Defense has just announced that it is considering options for Syria. That, however, is no danger as Syria has virtually no oil — just more expense and deficit spending for the US. Yes, it is tough to find a job in America which has exported so many jobs. Singapore is importing labor to do an in-country export of jobs from Singaporeans to low cost immigrants. Should the world economy tank (with Greece approaching default), who is going to feed all the new folks (and old) in Singapore? There are time-bombs all over the place. When the escalating oil prices causes wide spread paranoia, I think China will retaliate by changing Remimbi to gold backed currency killing USD as the reserved currency of the world. I think the americans and the europeans had enough, remembering most big revolutions started in europe, I guess there will be one soon enough. It does appear that Israel is going to war with Iran now. America, obviously is going to jump in, with Israel. We are going to see gas prices go thru’ the roof here! The cost of living will go up. Those Iranian sites that Israel want to bomb are buried deep underground??? Will this war be short? time will tell. Anything and everything can go wrong!